Our synagogue is convenietly located walking distance from the Gold Coast, River North, Near North, North Loop, South Loop, and Streeterville neighborhoods and easily accessible by CTA transit from any part of the city. 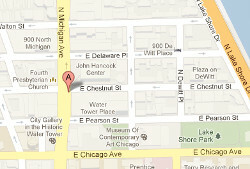 Central Synagogue is located in Suite 1449) at 122 S. Michigan Avenue. It is an office building on the west side of Michigan Ave (across the street from the Art Institute of Chicago.) The building entrance is in the middle of the block between Monroe St and Adams St. The building entrance has signs for National Lewis University which is also located in the 122 S. Michigan Ave, building. Discount Parking $10 for Saturday morning and Friday night services & evening programs. Park at the 55 E Monroe Garage with entrances on Monroe St and Adams St. Provide us with your ticket and we will validate it for you.